The NATO war on Yugoslavia which culminated in the 78-days bombing of historic cities and infrastructures – as usual under atrocity propaganda and pretexts – is on its 20th anniversary. The grim anniversary is admirably recognized by Science for Peace members to remember and to prevent who-knows-what NATO war crime next as “humanitarian intervention”. From Yugoslavia to Iraq to Libya, where does it stop? 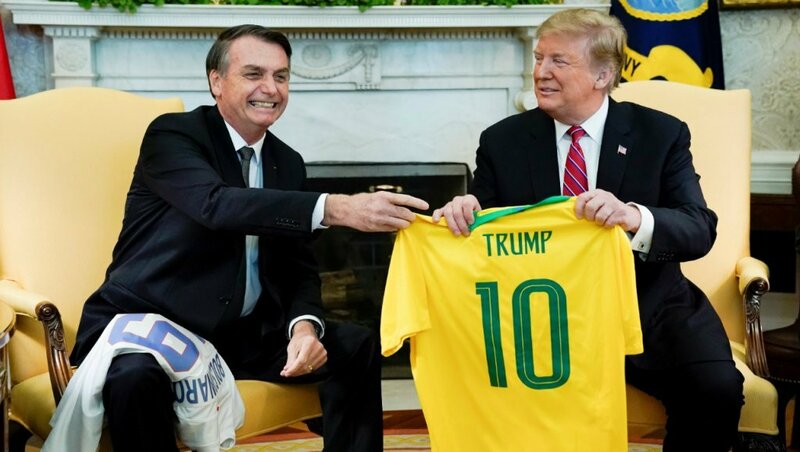 Observe that Trump is now seeking a NATO alliance with Bolsonaro Brazil (see image below) -to perhaps back the bombing of Venezuela, or any other society, including the Brazilian people, not bowing to US-led global corporate colonization. Socialist genocide is the unspeakable logic of the serial war crimes under international law. 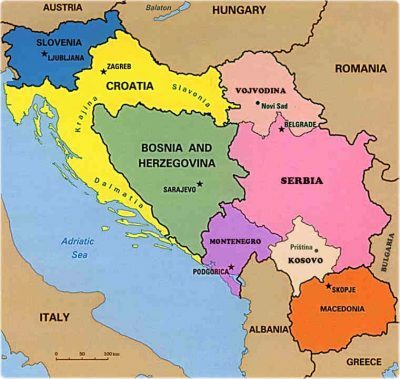 So it is important to remember the long war of economic and financial destabilization that occurred over years before and after the bombing to destroy federal Yugoslavia’s market socialism in every workers-control and social infrastructure it had evolved after 1945 to s olve the endless Balkan ethnic wars of its past history. This larger design is taboo to state – US-led genocide of any socialist society as covert state policy. Instead ‘freedom’ and ‘human rights’ is the reverse-mask every time which is relentlessly dinned into people’s heads. In this way, again and again, the non-stop succession of US international crimes under law is covered up into the present day. So too, federal Yugoslavia, once the envy of the world in democratic social progress, was destroyed step by step. Its bonding social infrastructures were dismantled by unceasing, all-fronts US financial war in which NATO bombing in 1999 was only the most evident event of the socialist genocide. Below are excerpts from Ottawa University Professor of Economics (emeritus) Michel Chossudovsky’s long-leading analysis which provides a minimalist through-line of the effectively genocidal war against all not-for-profit institutions of a socialist society in which Yugoslavia is a paradigm case. The selected text excerpts below are from Michel Chossudovsky’s 1996 article (updated in 2002) published as a chapter in The Globalization of Poverty and the New World Order, Global Research, Montreal, 2003. “But following a pattern set early on, the plight of the Balkans was promoted as the outcome of deep-seated ethnic and religious tensions rooted in history.1 Likewise, much was made of the “Balkans power-play” and the clash of political personalities: “Tudjman and Milosevic are tearing Bosnia-Herzegovina to pieces. “Lost in the barrage of images and self-serving analyses are the economic and social causes of the conflict. The deep-seated economic crisis which preceded the civil war had long been forgotten. The strategic interests of Germany and the US in laying the groundwork for the disintegration of Yugoslavia go unmentioned, as does the role of external creditors and international financial institutions. In the eyes of the global media, Western powers bear no responsibility for the impoverishment and destruction of a nation of 24 million people. Thus Yugoslavia’s war-ravaged successor states are left to the mercies of the international ‘financial community’. “As the world focused on troop movements and cease-fires, the international financial institutions were busily collecting former Yugoslavia’s external debt from its remnant states, while transforming the Balkans into a safe-haven for free enterprise. With a Bosnian peace settlement holding under NATO guns, the West had in late 1995 unveiled a “reconstruction” program that stripped that brutalized country of sovereignty to a degree not seen in Europe since the end of World War II. “As the West proclaimed its support for democracy, actual political power rests in the hands of a parallel Bosnian ‘state’ whose executive positions are held by non-citizens. Western creditors have embedded their interests in a constitution hastily written on their behalf. The neocolonization of Bosnia was a logical step of Western efforts to undo Yugoslavia’s experiment in ‘market socialism’ and workers’ self-management and to impose the dictate of the ‘free market’. “Multi-ethnic, socialist Yugoslavia was once a regional industrial power and economic success. In the two decades before 1980, annual gross domestic product (GDP) growth averaged 6.1 percent, medical care was free, the rate of literacy was 91 percent, and life expectancy was 72 years.11. But after a decade of Western economic ministrations and a decade of disintegration, war, boycott, and embargo, the economies of the former Yugoslavia were prostrate, their industrial sectors dismantled. “Despite Belgrade’s non-alignment and its extensive trading relations with the European Community and the US, the Reagan administration had targeted the Yugoslav economy in a “Secret Sensitive” 1984 National Security Decision Directive (NSDD 133) entitled “US Policy towards Yugoslavia.” A censored version declassified in 1990 elaborated on NSDD 64 on Eastern Europe, issued in 1982. The latter advocated “expanded efforts to promote a ‘quiet revolution’ to overthrow Communist governments and parties,” while reintegrating the countries of Eastern Europe into a market-oriented economy. “The US had earlier joined Belgrade’s other international creditors in imposing a first round of macroeconomics reform in 1980, shortly before the death of Marshall Tito. That initial round of restructuring set the pattern. “Secessionist tendencies feeding on social and ethnic divisions, gained impetus precisely during a period of brutal impoverishment of the Yugoslav population. The economic reforms “wreaked economic and political havoc… Slower growth, the accumulation of foreign debt and especially the cost of servicing it as well as devaluation led to a fall in the standard of living of the average Yugoslav… The economic crisis threatened political stability … it also threatened to aggravate simmering ethnic tensions”. “These reforms accompanied by the signing of debt restructuring agreements with the official and commercial creditors also served to weaken the institutions of the federal State creating political divisions between Belgrade and the governments of the Republics and Autonomous Provinces. A Reaganomics arsenal ruled. And throughout the 1980s, the IMF and World Bank periodically prescribed further doses as the Yugoslav economy slowly lapsed into a coma. “From the outset, successive IMF sponsored programs hastened the disintegration of the Yugoslav industrial sector, lunging to zero in 1987-88 and to a negative 10 percent growth rate by 1990.15 This process was accompanied by the piecemeal dismantling of the Yugoslav welfare state, with all the predictable social consequences. Debt restructuring agreements, meanwhile, increased foreign debt, and a mandated currency devaluation also hit hard at Yugoslavs’ standard of living. “The IMF also effectively controlled the Yugoslav central bank. Its tight money policy further crippled the country’s ability to finance its economic and social programs. State revenues that should have gone as transfer payments to the republics went instead to service Belgrade’s debt with the Paris and London clubs. The republics were largely left to their own devices. The economic package was launched in January 1990 under an IMF Stand-by Arrangement (SBA) and a World Bank Structural Adjustment Loan (SAL II). The budget cuts requiring the redirection of federal revenues towards debt servicing, were conducive to the suspension of transfer payments by Belgrade to the governments of the Republics and Autonomous Provinces. “In one fell swoop, the reformers had engineered the final collapse of Yugoslavia’s federal fiscal structure and mortally wounded its federal political institutions. By cutting the financial arteries between Belgrade and the republics, the reforms fueled secessionist tendencies that fed on economic factors as well as ethnic divisions, virtually ensuring the de facto secession of the republics. The IMF-induced budgetary crisis created an economic fait accompli that paved the way for Croatia’s and Slovenia’s formal secession in June 1991. “In less than two years the World Bank’s so-called “trigger mechanism” (under the Financial Operations Act) had led to the lay off of 614,000 (out of a total industrial workforce of the order of 2.7 million). The largest concentrations of bankrupt firms and lay-offs were in Serbia, Bosnia-Herzegovina, Macedonia and Kosovo. “The consensus among donors and international agencies was that past IMF macroeconomics reforms inflicted on federal Yugoslavia had not quite met their goal and further shock therapy was required to restore “economic health” to Yugoslavia’s successor states. – – The neocolonial administration imposed under the Dayton accords and supported by NATO’s firepower had ensured that Bosnia’s future would be determined in Washington, Bonn, and Brussels rather than in Sarajevo. “Western governments and corporations showed most interest in gaining access to strategic natural resources. With the discovery of energy reserves in the region, the partition of Bosnia between the Federation of Bosnia- Herzegovina and the Bosnian-Serb Republika Srpska under the Dayton Accords has taken on new strategic importance. Documents in the hands of Croatia and the Bosnian Serbs indicate that coal and oil deposits have been identified on the eastern slope of the Dinarides Thrust, retaken from Krajina Serbs by the US-backed Croatian army in the final offensives before the Dayton accords. Bosnian officials had reported that Chicago-based Amoco was among several foreign firms that subsequently initiated exploratory surveys in Bosnia. “With their attention devoted to debt repayment and potential energy bonanzas, both the US and Germany have devoted their efforts –with 70,000 NATO troops on hand to “enforce the peace – – – “. History repeats itself in patterns not events. The pattern of criminal US destabilization and destruction of social states to loot them of their sovereign resources is the unseen history of the last century of the world. Yugoslavia provides the cornerstone example since the Nazis inside Europe with Ukraine taken down since in the same pattern still taboo to see. US-led NATO is the transnational war machine of the world devouring all public wealth it can extort to terrorize all into conformity to the global-carcinomic regime. The NATO that bombed Yugoslavia 20 years ago and Iraq and Libya since is also the greatest polluter, waster, and destroyer of the global environment beneath all notice of it. The US-NATO borderless armed-force maw invisibly leads the climate chaos upon us across continents. It is the greatest rising carbon spewer of all time, but not once mentioned even by the UN International Panel on Climate Change. The US-led post-Nazi incubus of NATO may be the most wasteful black-hole despoliation of the earth and its future possibility ever, with oil its blood and mass-killing its method. Yet the official world remains blind to it in “we did not know” sanctimony and accusation all life resistance as the problem. The twentieth anniversary of the US-led NATO bombing of Yugoslavia as NATO ‘humanitarian intervention’ should be a tragic self-recognition for the ages. In this expanded and updated edition of Chossudovsky’s international best-seller, the author outlines the contours of a New World Order which feeds on human poverty and the destruction of the environment, generates social apartheid, encourages racism and ethnic strife and undermines the rights of women. The result as his detailed examples from all parts of the world show so convincingly, is a globalization of poverty. This book is a skillful combination of lucid explanation and cogently argued critique of the fundamental directions in which our world is moving financially and economically. In this new enlarged edition – which includes ten new chapters and a new introduction — the author reviews the causes and consequences of famine in Sub-Saharan Africa, the dramatic meltdown of financial markets, the demise of State social programs and the devastation resulting from corporate downsizing and trade liberalisation.